Advanced Crane Technologies (ACT) specializes in the rehabilitation of overhead cranes where replacement is not feasible because of cost or logistic reasons. When considering improving your overhead lifting needs, contact ACT to evaluate your requirements. After gaining a thorough understanding of your requirements and evaluating your existing equipment, our team of experts will recommend the solution or solutions that best meet your budget. After a thorough rehabilitation by ACT, your crane will be as good as a new crane, if not better. In many cases ACT can evaluate your existing crane and find hidden performance in the way of increased capacity or speed to benefit your operation at a fraction of the cost of replacing your crane. Most crane companies do not have this ability, and will only offer you a replacement crane which is in their best interest, not yours. 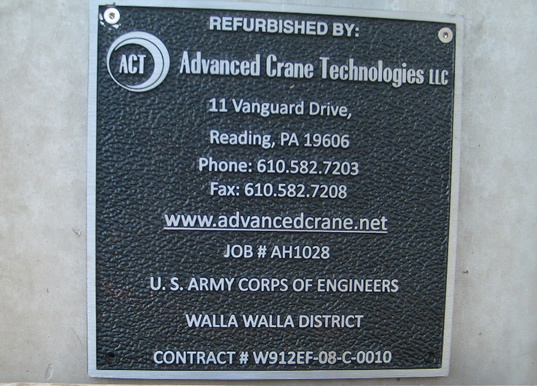 ACT’s personnel offer many years of experience in crane design, and trouble shooting, in all types of manufacturing, power generation, and warehousing applications. Our broad experience base and network of industry experts allows us a fresh perspective to find and eliminate nagging problems with your cranes, getting your facilities back on track. We also offer independent 3rd party inspections, and condition reports to help you evaluate if you are getting the most for your crane maintenance dollar, or help you prepare for upcoming capital expenditures. Advanced Crane Technologies is now offering Arc Flash Analysis for electrical equipment as part of our overall commitment to being a “complete” turn-key solution provider. New OSHA & NEC/NFPA regulations require crane owners to plaquard control panels with a standardized label outlining what Personal Protective Equipment, (P.P.E.) is required prior to opening an energized panel. Advanced Crane Technologies can offer this service as part of a new contract or as a “stand alone” service for clients with existing cranes. Contact us for more details on the following services ACT offers for crane and material handling applications.